When the Dutch arrived in the Cape in 1652 there was very little infrastructure and it was the task of van Riebeeck to build a fort for the protection of his people as well as to plant gardens to supply Dutch ships calling at the Cape with fresh produce. The gardens were a mammoth task and soon van Riebeeck found that he needed labour to work in them. The VOC (Dutch East India Company) introduced slaves into the Cape to work in the gardens. Even with these additional people the refreshment station could not cope with the demand and so the VOC allowed staff members who had completed their contracts to stay on at the Cape and gave them farms so that they could produce food for the colony. These ex employees became known as free burghers. Over the years the free burghers branched out and planted different crops amongst them wheat. As the supply of wheat grew so did the demand for wheat products necessitating the building of mills to crush the wheat for flour. 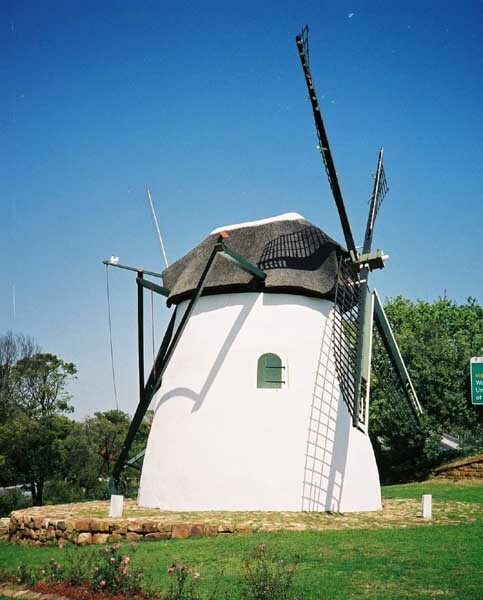 As Holland had all the technology and expertise to build wind driven mills it was natural for them to build them at the Cape to assist the wheat industry. A number of them were built around the Cape Colony but today only three remain. 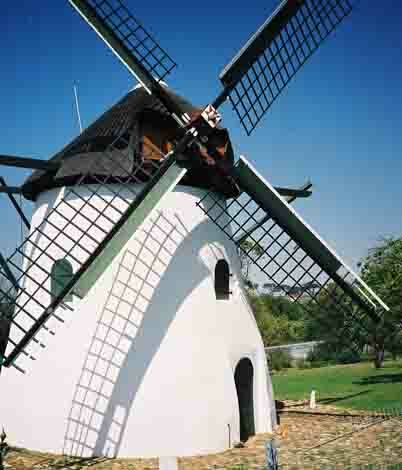 The oldest is the Nieuwe Molen mill which was completed in 1782 and still stands in the grounds of the Alexandra Hospital in Maitland. This mill was built for the Burgher council who owned it until 1807 when it was acquired by a free Bhurger named K C Dekanah. It remained in his family until 1847. Nieuwe Molen Mill as it is in October 2016. The ownership of the mill from 1847 onwards is unclear but in 1901 the Colonial Government of the Cape purchased the mill and erected a hospital around it. The mill has been part of the Alexandra Institute ever since and stands proudly overlooking the M5 highway into Cape Town. Although the mill can be seen from the M5 roadway it was forgotten by the local tourist board. This oversight was finally corrected in 1978 when the mill was placed on a list of national monuments in South Africa. One however cannot blame Cape Town locals for forgetting about the mill as the hospital grounds in which it stands are strictly controlled and access to the mill is not allowed. I made a number of requests to hospital staff to be allowed to photograph it but was told that it was not possible. Senior staff at the hospital would not even take my calls. What could become a tourist attraction if handled properly is being hidden away from the public. Sadly it is deteriorating quickly and could do with a coat of paint. It's a pity as by comparison to the other mills in Cape Town this one appears to be the biggest of the three. The second oldest mill in Cape Town is Mostert's Mill. 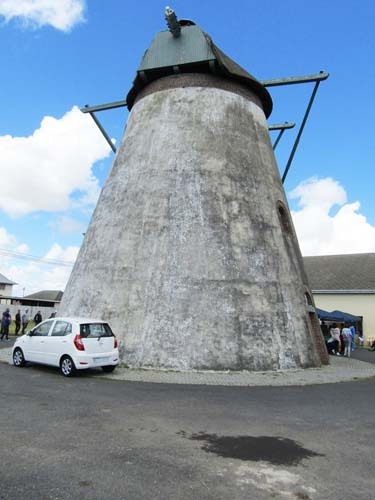 It was built in 1796 and was later named after Sybrand Jacobus Mostert who bought the mill and surrounding property on the death of his father-in-law, Jacob Van Renen in 1823. The mill has changed hands a number of times over the years and was finally purchased by Cecil John Rhodes when he bought the farm Welgelegen in 1891. 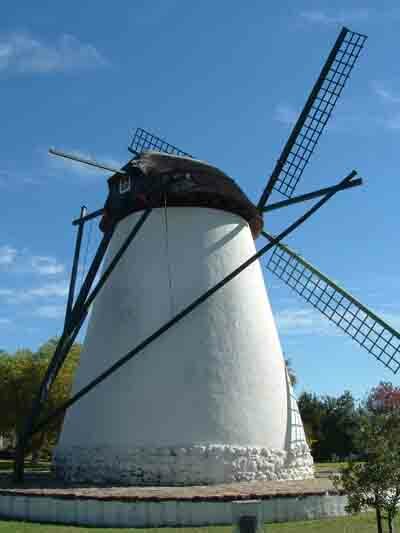 An interesting fact about this mill is that although it is of Dutch design it was in fact built during British rule at the Cape. As normally happens with any building it finally falls into disuse and starts decaying. This has happened twice in the Mostert's Mill's lifetime and twice it has been rescued and restored. The first time it was restored was in 1935 when the Department of Public Works did the restoration. The second time was in 1995 when the Friends of Mostert's Mill refurbished the mill. To defray expenses the mill is opened to the public on Saturday mornings when it is brought back to life and wheat is ground using wind power. Samples of the flour are on sale at the mill. The siting of the mill on the lower slopes of Devil's Peak was to enable it to catch the wind. These days to keep the sails intact during periods of disuse the mill is parked with the sails facing Table Mountain and away from the south east wind. 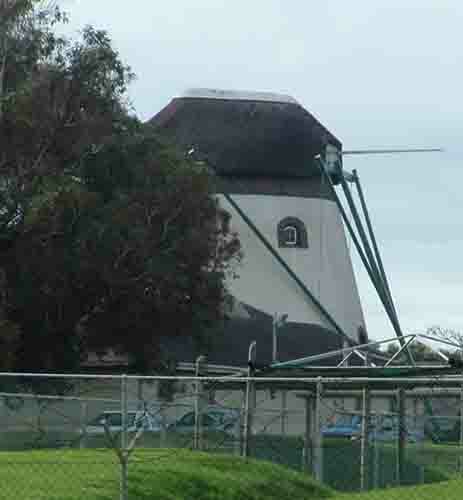 All three of the mills in Cape Town are parked the same way with the sails being protected by the body of the mill. The third mill and the one I discovered by chance last week is situated in the town of Durbanville. It's called the Onze Molen Mill and today is the centre attraction of the small Onze Molen housing estate which surrounds the mill. In 1801 when Durbanville was still known as Pampoenskraal (Pumpkin Kraal) the land on which the mill stands was granted to a free bhurger named J J Uys and a widow whose surname was Roeland. Small parcels of land were granted to artisans in those days to carry out their trade and build a home for themselves. The land received by Uys and Roeland was too small for agriculture and was not allowed to be used for the farming of livestock so it had limited use. 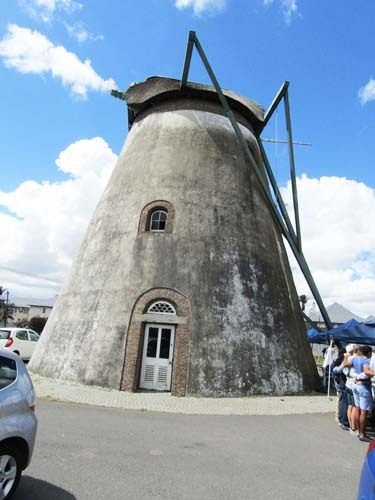 At the time there was an increased demand for wheat products in the Cape and the two mills Mostert's and the Nieuwe Molen could not handle the demand. To satisfy the demand mills were constructed further out of town and Onze Molen was one of them. It is unknown when exactly the Onze Molen mill was built and who built it. From research done it appears that J J Uys built the mill. Uys was however granted a further 36 morgan of land in 1812, and the entire property was sold to Mezst van der Spuy Meyburgh in 1837, shortly before Uys died. If the mill was constructed by Uys it was definitely built before 1840 and more than likely between 1801 and 1809. If it was built in 1840 then Uys was not the builder of the mill. Suffice to say the mill was built some time in the early 19th century and after its initial period of activity it too fell prey to disuse and decay. Eventually in the early 1900's the mill was dismantled and the wings and machinery were removed. Legend has it that the mill eventually became a horse driven mill for a period before it fell into total disuse and became derelict. It was during this period of its life that it became a labourer's cottage. The farm Johannesfontein on which the mill stood was finally bought by a Mr Brinkworth in 1963 and was renamed Onze Molen. Brinkworth's wife saw the potential of restoring the mill but after doing her research came to the conclusion that restoring the mill would be impractical. Eventually in 1983 the farm was sold to the Natal Building Society who decided to research the possibility of restoring the mill and after consultations with the National Monuments Council went ahead and did so in 1984. As the restorers could find no plans for the original Onze Molen mill they used Mostert's mill as their restoration example. Today although not open to the public the Onze Molen mill stands proud in a public space in the centre of the Onze Molen housing development. 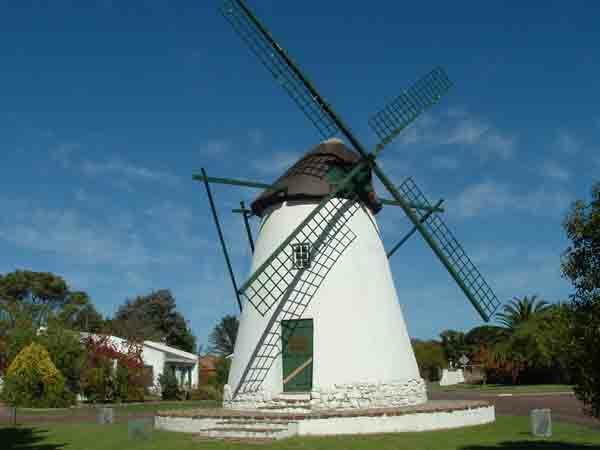 These mills are but one small example of what one can discover when you explore Cape Town.